History reminds us that lots of nasty practices were -- or still are -- legal. Apartheid was once legal in South Africa and is becoming increasingly so in Israel. Slavery was once legal in the U.S. and remains so in countries where consumer products are created for the U.S. market. Segregated access to public transportation was once legal in Montgomery, Alabama but it was successfully opposed by a boycott that spread like wildfire under the leadership of Rosa Park and her coalition partners. The second time Parks was arrested, it wasn't for refusing to get to the back of the bus; it was because boycotting was illegal. Following the UK's lead, the U.S. Congress took a giant step toward protecting the state of Israel from boycotts, divestment and sanctions (BDS) aimed at ending the violent occupation of Palestine. But you will not likely read about the special status of Israel in the corporate "news" about the Trade Facilitation and Trade Enforcement Act of 2015. Nor, for that matter, has the public heard much about the highly toxic TTIP in any of its aspects. But that's the topic for another post. Why is the U.S. government specifically aiming to squelch the BDS movement? 1) Because it has such a special relationship with Israel; and 2) because BDS is working. The fizzy drink maker with the factory in occupied Palestine shut down their plant after international pressure on the SodaStream brand. That was after the actress who is the face of the brand's ad campaign was asked to resign from her Global Ambassador position with international humanitarian aid organization Oxfam. (Full disclosure: I've been boycotting her films ever since). 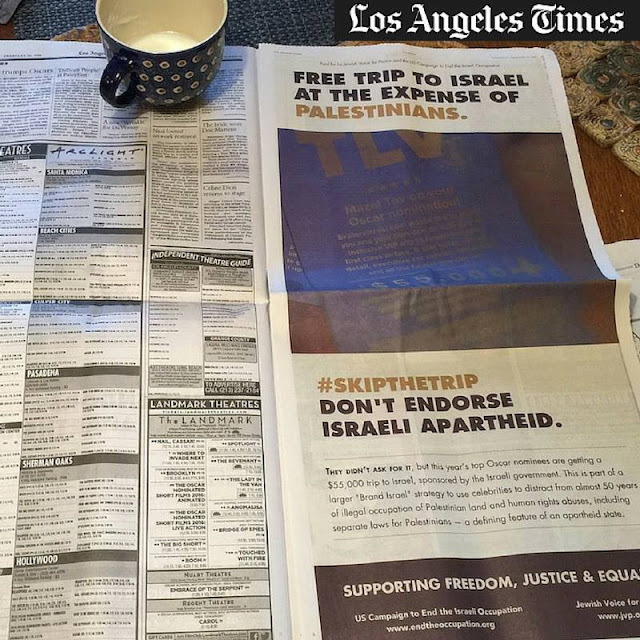 Source: US Campaign to End the Israeli Occupation facebook posted on February 24 with the comment, "Look what's in today's LA Times after we were censored by Variety! We need to continue pushing on this campaign to urge Oscar nominees to#SkipTheTrip so please find resources and actions to take here: http://bit.ly/1Tm04Gb." And, as long as we're in Hollywood, let's note the lawsuit brought by the Academy of Motion Pictures Arts & Sciences against the purveyor of the "swag bag" given to Oscar nominees in certain big categories. Responding to a voucher in the bag for a free trip to Israel worth $55,000, Palestinian activists have called on Oscar nominees to "reject Israel propaganda trip" because of Israel's apartheid policies. The Academy is distancing itself from the company that distributed the bags and assembled their contents, using court filings to say loudly and clearly that the swag bags and their contents have no official relationship with the Oscars. Did the marijuana vaporizer or the trip to Israel inspire the lawsuit? We may never know. It's very doubtful that a journalist working for a major media corporation will delve into it. Institutions of higher learning with active divestment campaigns include Tufts, the University of Mississippi, Harvard and MIT, Columbia/Barnard, Kansas State, Evergreen State College and Stanford among others. There are ongoing attempts to silence campus groups that criticize Israel or punish them for even debating the issues. Heard about any of that on the evening news? The Israeli government is planning to pour $26 million this year alone into a covert cyber operation to attack and sabotage the global human rights movement for Boycott, Divestment, and Sanctions (BDS), earmarking large sums for technology companies to spy on Muslim activists in the United States and Europe.